It's just a zucchini frittata which means several eggs, zucchini and onion sliced really thin sauteed till golden and then put into the eggs...of course you add a good handful of grated parmigiano and some salt and pepper. 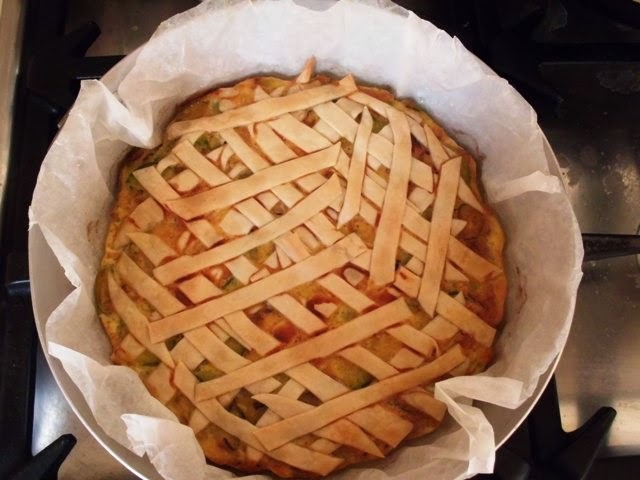 Line the tin with parchment, oil the parchment with olive oil and then whilst spreading the frittata flat on top you remember that you have some extra pie dough - so you lattice-work the top with strips. Ok so it's not a professional lattice-work with the strips - this is not a food blog folks! è un capolavoro di bontà!